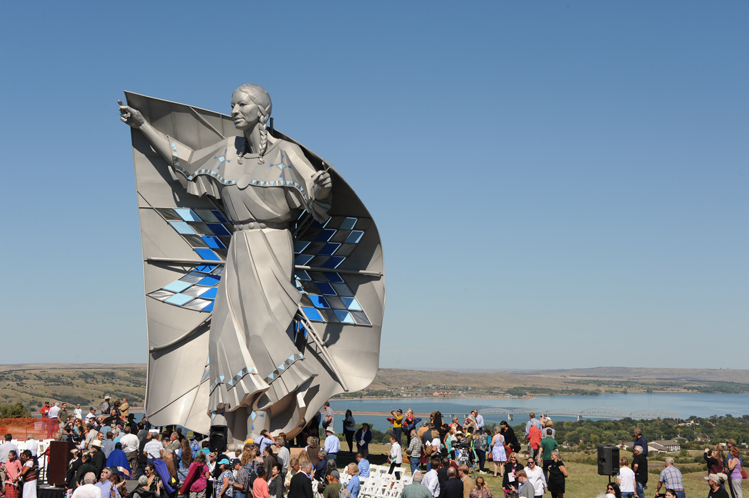 South Dakotans saluted and welcomed Dale Lamphere’s Dignity sculpture on a Missouri River bluff above Chamberlain on Saturday. Photos by Bernie Hunhoff. The city’s local VFW posted the colors to begin the program, which featured preachers, politicians, artists and Native American singers and dancers. Front and center were Gov. 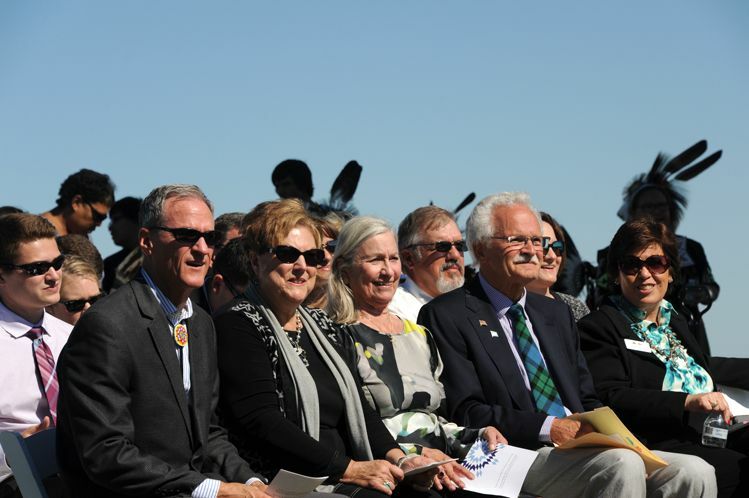 Dennis and Linda Daugaard, seated by Eunabel and Norm McKie, the well-known automobile dealers in Rapid City whose philanthropy made the project possible. 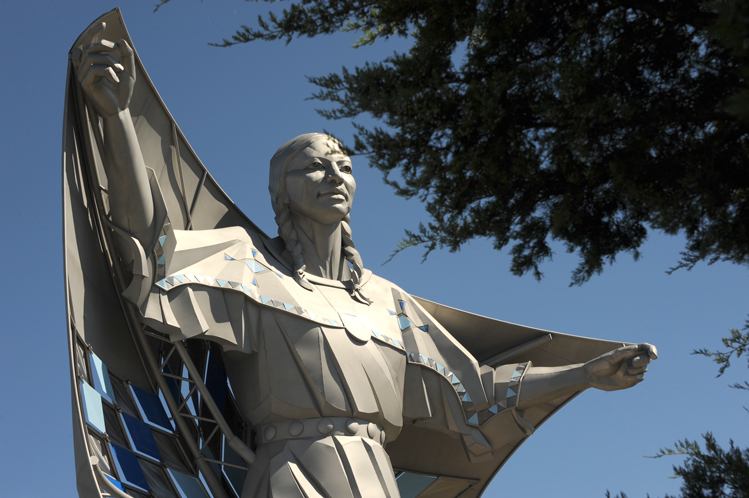 The McKie family funded the sculpture as a 125th birthday gift to the state of South Dakota. 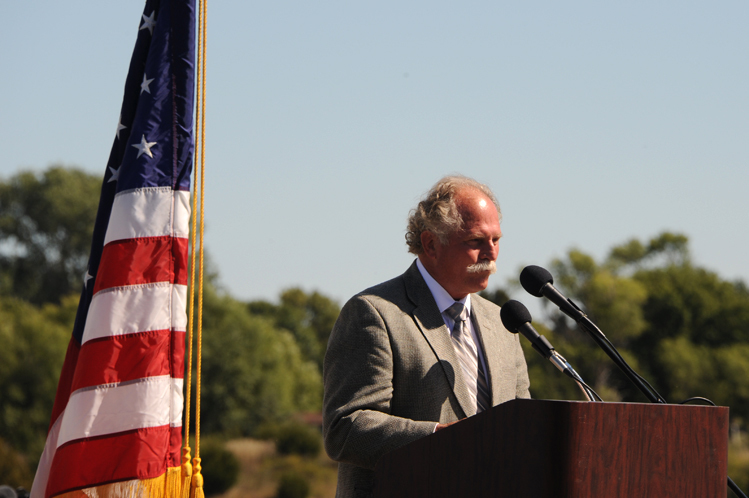 An immense crowd enjoyed the ceremonies on a warm September day above the river. 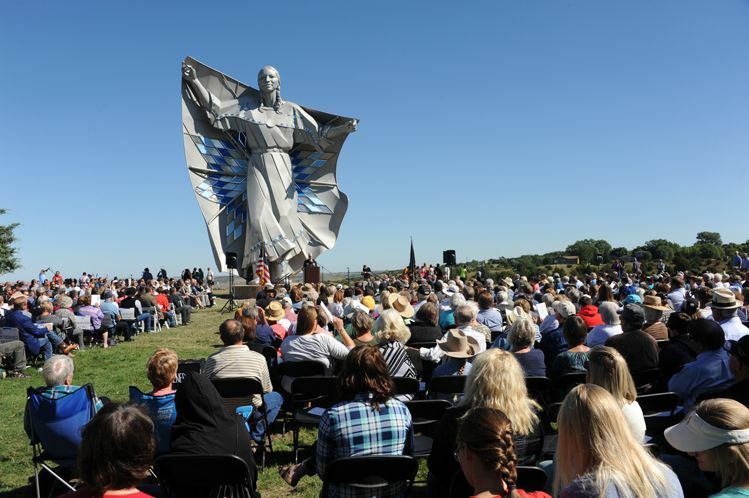 South Dakota’s noonday sun only added to the splendor of the unveiling. 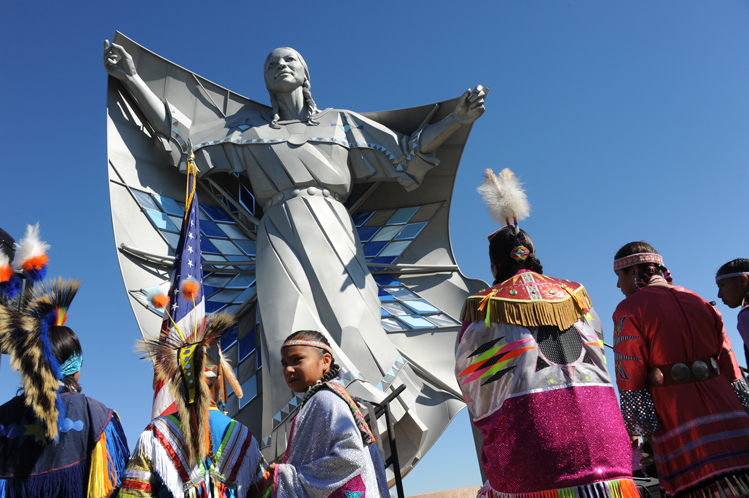 The sculpture, titled Dignity of Earth and Sky, stands 50 feet tall and is made mostly of stainless steel. LED lighting provides a special effect after dark. It is very visible from nearby Interstate 90, looming above one of the most picturesque valleys on the entire 3,000-mile long highway. It was a poignant and picturesque moment when members of the Lakota Women Warriors stood before Dignity. 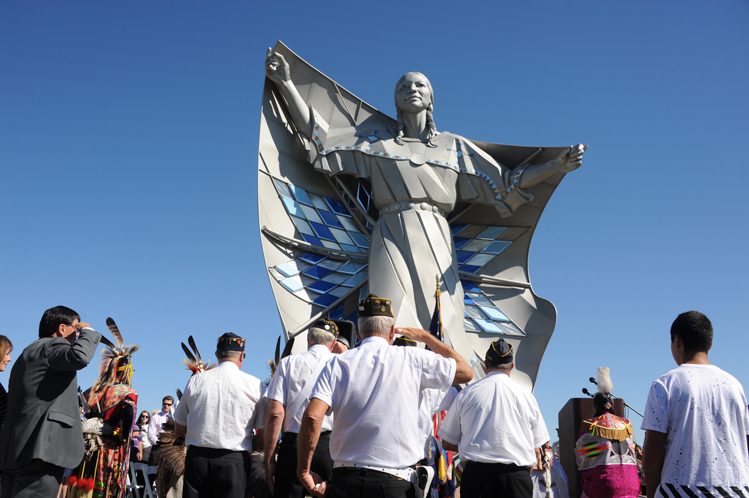 The group of veterans from the Cheyenne, Pine Ridge and Standing Rock reservations, was recently formed not only as a military color guard but also as a united way to serve the people of their tribes. Stan Adelstein of Rapid City is best known around the state as a philanthropist, business leader and former state senator. 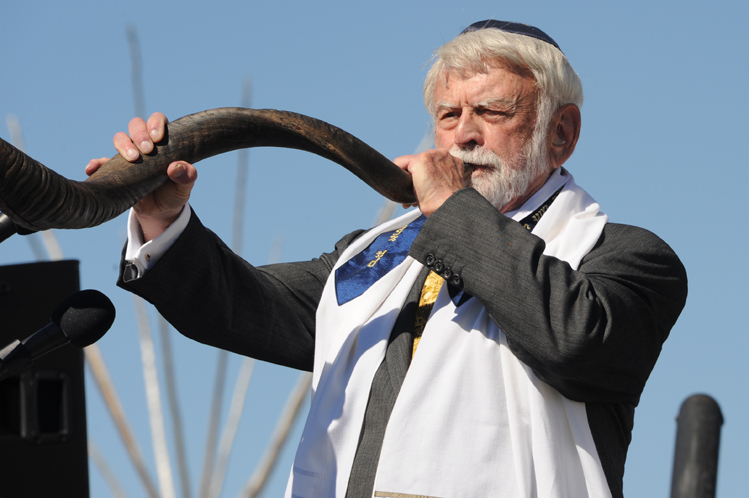 He also serves as a leader of the Jewish community, and in that capacity he played notes on the shofar, a sacred horn made from a ram’s horn. State Sen. Troy Heinert of Mission, who has both Native and non-Native roots in South Dakota, spoke of the state’s sometimes-troubled history of race relations and voiced a hope that Lamphere's Dignity might bring people together — as it did on Saturday. Dignity is the figure of a confident Native woman wrapped in a star quilt. Youth from the Wambli Ska Dance and Drum Society added color, festivity and meaning to the ceremony. 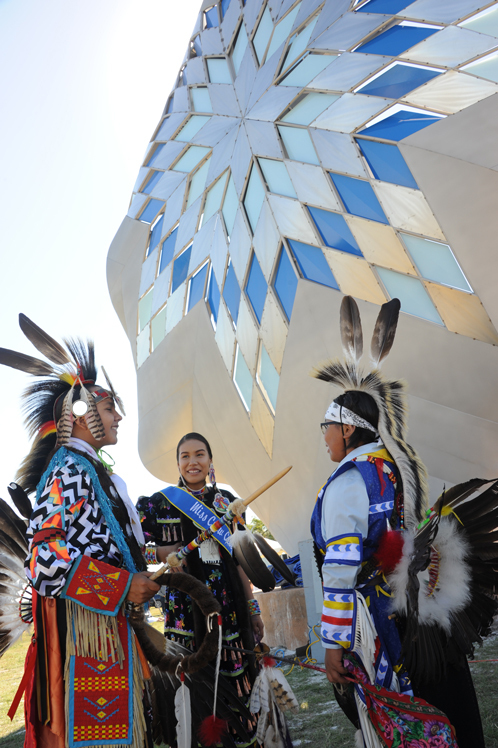 They were joined by the Blue Bird Drum Group and the Dakota Boyz Teca Youth Drum Group. The sculpture dwarfs a few cedar trees that grow nearby. It stands so tall that it seems the artist Lamphere uses the sky as a complement to his aluminum creation. Lamphere spoke briefly — thanking the McKie family and his fellow workers, who were still tending to last minute details on the sculpture in the hours before the program. He joked that transporting the piece from Scenic to Chamberlain pushed oncoming traffic into the ditch for 12 hours on Highway 44. 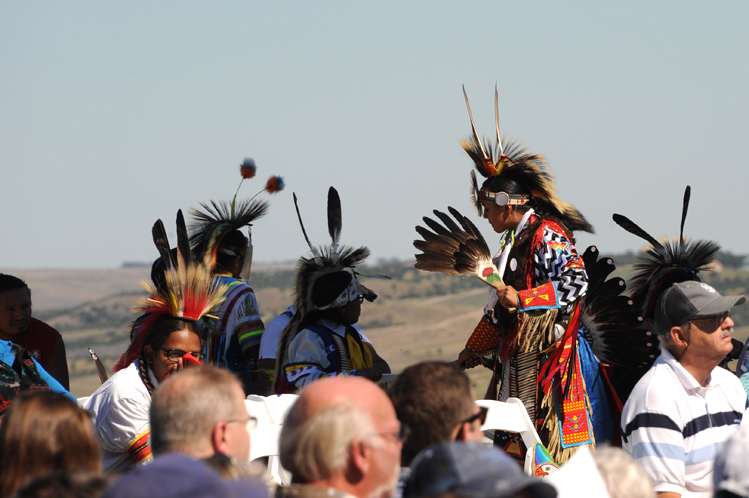 The crowd at the ceremony was a festive show of South Dakota’s diversity. Belinda Joe’s song and words enchanted the crowd. 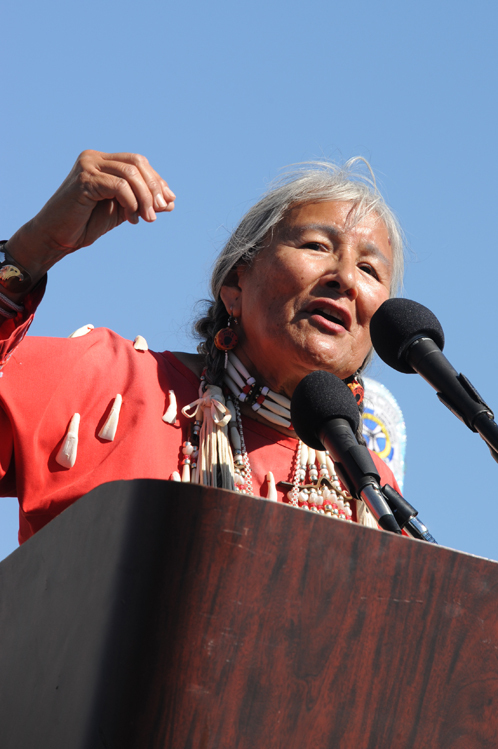 She is a teacher and storyteller from the Crow Creek Reservation. 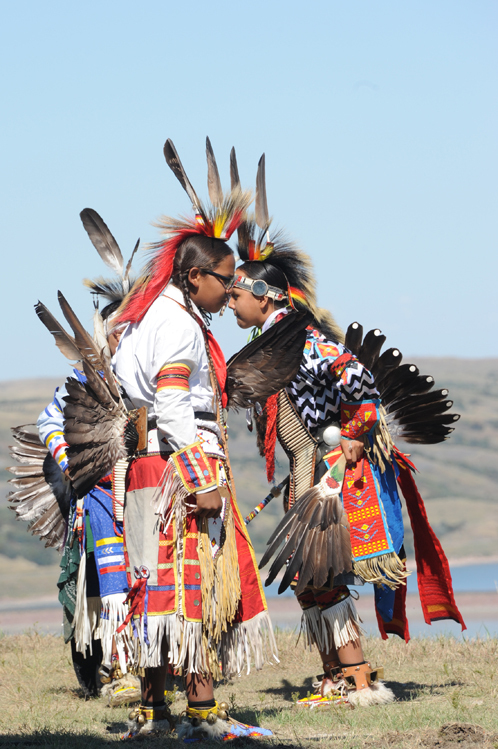 During the speech-making, two boys from the Wambli Ska Dance and Drum Society practiced their dance steps on the hillside. 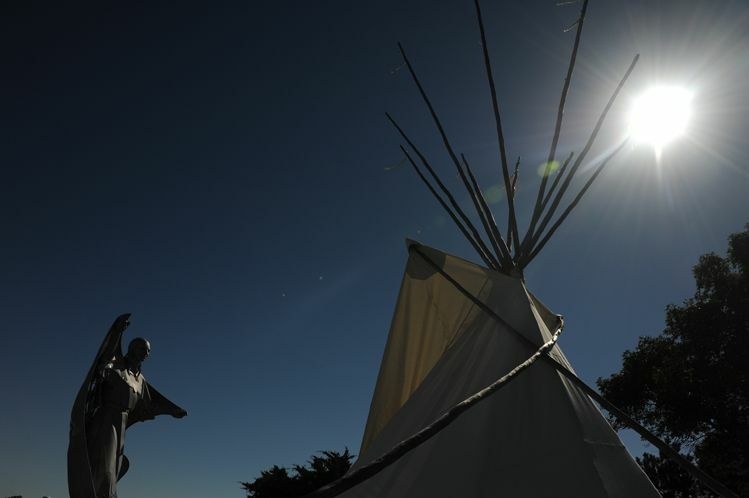 Ed Iron Cloud, a former state lawmaker and Native American activist and leader, erected tipis at the site of the ceremony. Kris O’Rourke provided star quilts for the Daugaards, the McKies and others. Gov. Daugaard noted that Dignity joins the stone sculptures in the Black Hills as a new symbol of unity for all South Dakotans. Magnificent, all Hale to my home land of South Dakota!! Congratulations to the Chamberlain collective that gave the gift of 'Dignity of Earth & Sky' to not only South Dakota but the world. Through a SD woman posting the upcoming event on Facebook, then a Manitoba (Canada) woman sharing it, I in Queensland (Australia) was able to watch this beautiful event in real time via the SDPB internet link, see & appreciate this magnificent monument, and share it with so many others, who are also in awe of what had been accomplished, and the heartfelt message of reconciliation. Thank You once and all. My husband and I stopped to see this regal beauty today. Standing so majestic....Dignity is absolutely breathtaking and amazing. She is a gift to all and her creator simply perfect. This is amazingly beautiful. I love her meaning and the artistry that was put into her. I want to see it in resin. Definitely oy bucket list. The world needs to know about her. I'd like for the story be on national tv shows. Dignity is beautiful, but a person needs to stop at least twice to see the difference. if you stop during the day she is exquisite silver. If you stop 1/2 hour to one hour before it gets dark she turns bronze in color. Once it's dark and she is lit, both externally from spotlights and internally from the built in lighting, the colors are magnificent. Nice article, as always well written and great coverage of the event. Yes we are truly blessed here in Chamberlain! 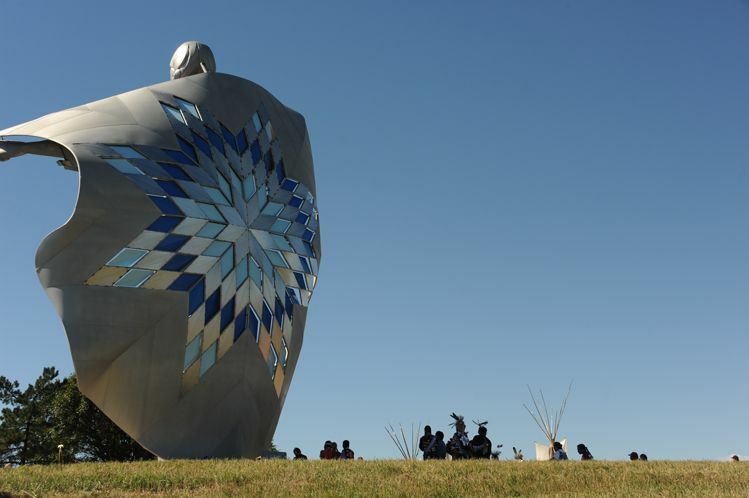 Absolutely beautiful, both in concept and artistic craftsmanship.... a tribute to the artist as well as the Native American women of the Lakota, Dakota and all others. 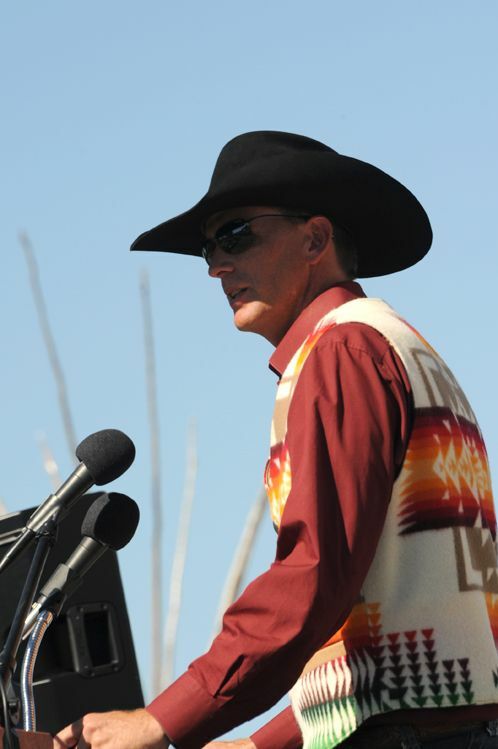 Congratulations and thanks to Dale Lamphere and South Dakota. It is a magestic and beautiful tribute representing the Native love for their never forgotten Ancesters and memories of the past and present. I've seen The Beauty of Beautiful.Its amazing how hugh this Awesome Art work is.Never seen it in person,but will one day. I am of The Great Lakota Sioux Tribe.This is a Honor.Thank you for recognizing the awesome strength of a Native American Woman. Thanks. 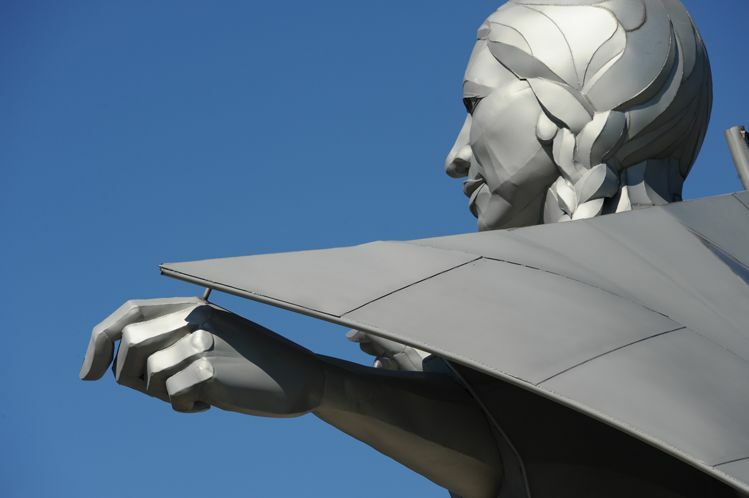 A well deserved memorial to all the Native American Women who sacrificed their lives to foster their families. Such a beautiful work of art. I just got word of this today. 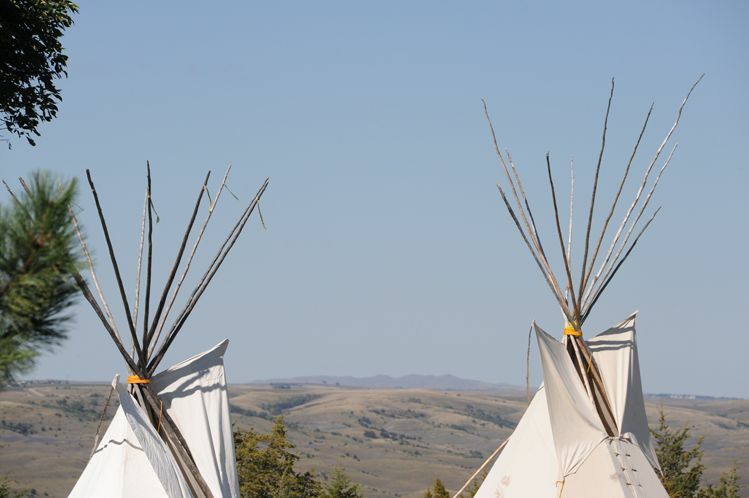 A great tribute to the Lakota's. Great work and promotion of the history of Native People in America .i love the work he did .thank You. I wonder if someone has the song and words of Belinda Joe when she enchanted the crowd.